Well, “we” don’t. You do, and we’ve been meaning to talk to you about that. Man, they sure got Rachel’s gravestone set up quickly, considering she had no money or family and she was found dead on the couch in somebody else’s house with three unsolved bullet holes in her gut. But I guess everybody’s in a hurry today, including me. I don’t like to bring my personal process into the blog too much, but I’m writing this on the Sunday evening after Thanksgiving, and I am currently two episodes in the hole, plus I haven’t even watched next week’s episodes yet. I spent the holiday weekend at Disneyland, which was great, thanks for asking, but didn’t leave me with a lot of energy for Collinsport-related matters. I just got Wednesday’s post up before dinner, and now here we are, starting on Thursday’s, with zero chance of getting to Friday’s before Monday. It’s my own personal time travel paradox. At moments like this, I go to Plan C, which is to write a not very good blog post. Usually, I stick to Plan B, which is to write a pretty good blog post. I don’t have a Plan A. Nobody does. In a pinch like this, it would be great to be able to focus on one scene, or follow a particular line of thought, but this is the episode where everything happens all at once. So basically I’m just going to start typing; this is as close as you’re going to get to a Dark Shadows Every Day DVD commentary track. 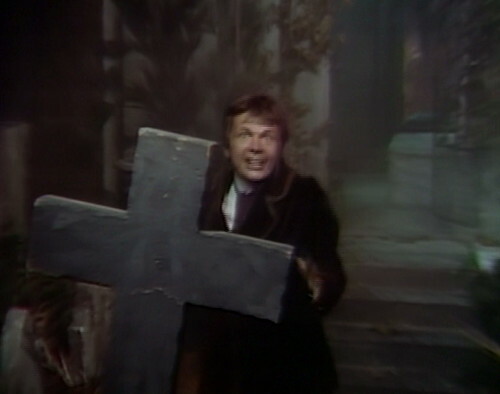 First up: Barnabas at Rachel’s grave, moping. “That I should come to this century, and find you so like Josette,” he sighs, which is interesting, because Rachel was precisely nothing like Josette in everything except eye color. Rachel was a scrappy Nancy Drew type orphan with a tragic past and a creepy child-molester father figure. She worked at a job that was beneath her, in an environment determined to crush her spirit, and she still found the time to run around and get involved in other people’s problems. Josette was French. Where is the comparison here? “Will we meet again?” He’s still monologuing. “Will I have a chance ever, to right this wrong?” because obviously this is all about Barnabas, as usual. My advice to any bright sparks starting out in the Josette business is to try a different line of work. It never pans out, and you don’t even get the good speeches. But then, coming out of the dense fog — the smoke machine must be set at the level marked World’s First Indoor Burning Man — here comes Angelique, who we haven’t seen enough of lately. We’re just barely seeing her now. Angelique has become the deadline fairy for this storyline; she turns up every once in a while to say that there isn’t much time for whatever they feel like wrapping up. It’s a very useful skill. She’s a witch, and she’s visiting from a different time period, so it makes sense that she’s the character who can step back and see the big picture. I mean, not normal common sense, but a kind of gut emotional sense that works just as well. Plus, she’s one of the four major kaiju, so the audience believes everything that she says. The kaiju are the most interesting characters on the show, the permanent fixtures that hold Dark Shadows together. 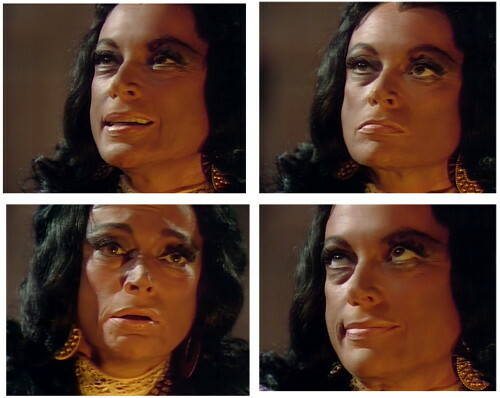 The big four are Barnabas, Julia, Angelique and Quentin, and all four of them are in today’s episode, if you count Magda as a version of Julia, which I do. The kaiju make all the big decisions, and they’re usually getting intel direct from the writers’ room, so if they think something is important, then that’s the thing we’re supposed to pay attention to. For Angelique, every situation is an opportunity for her to talk to Barnabas about their relationship. If they were trapped in a burning building — and by all appearances, that is exactly where they are — she would still want to discuss why he won’t accept that she’s on his side. Now, I have to say that I can’t quite remember that myself. She’s helped Quentin, I remember that — or, at least, she tormented Quentin and then stopped tormenting him, which in her world is the same thing as helping someone. She helped to get rid of Laura, but that was more of a pro-bono community service type deal where everyone agreed that Laura needed to go, and Angelique was the one who pulled the trigger. 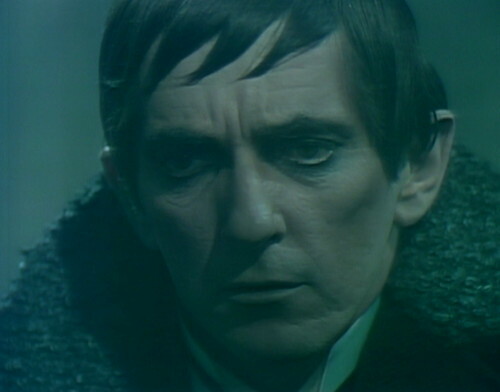 “Oh, go on, Barnabas,” she sighs. “Go on.” She lowers her head in weary resignation, and at that exact moment we hear the crow of the Convenient Rooster. You see? She’s even got the sound effects guy on her side. You can’t beat the major kaiju; they run the place. 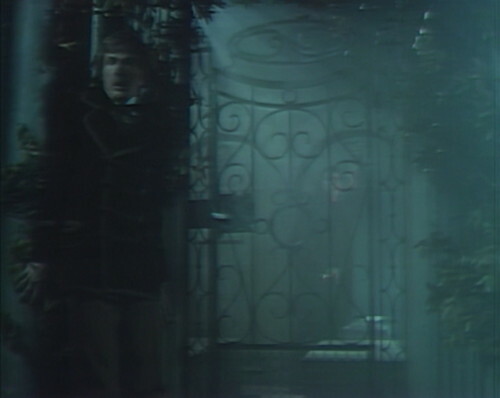 Carl is lurking nearby, and he sees Barnabas open up the secret room in the mausoleum, which is something of a minor miracle given the prevailing weather conditions. “Barnabas!” he exclaims. “Barnabas is the vampire!” And then he runs offstage. This is going great so far. Coming back from commercial, we get a faceful of phonograph, blaring “Quentin’s Theme” at us. This episode aired on the first week that The Charles Randolph Grean Sounde appeared on the Billboard charts with their version of “Quentin’s Theme”, coming in at #85 — just under Frankie Valli’s “The Girl I’ll Never Know (Angels Never Fly This Low)” and just above Bob Dylan’s “I Threw It All Away”. Under that was Frankie Laine’s “Dammit Isn’t God’s Last Name,” which I am noting here for obvious reasons. Quentin is drinking, and Magda comes over to talk, so hooray, that clears your major kaiju bingo card for the day. This scene is mostly just Quentin doing a greatest hits album; it sounds something like this. Oh, the same old Magda, cruel to the end! So, you visited with your tribes, and you compared notes on picking pockets, and the newest way in telling fortunes, and you exchanged your secrets of all of your curses, and you all laughed, and how they must have laughed when you told them that you had turned a Collins into a werewolf! A king! Well, did he sign a decree? Did he offer a royal proclamation that all curses were to end, did he? Do you have any idea what it’s like sitting here, waiting, counting the days until there’s a moon that’s full? Is this one of your jokes? Are you playing more games? And then he puts Magda in a painful armlock. Then it’s Magda’s turn, so she does one of her close-order facial expression drills, registering every possible emotion, including several that she just invented on the spot. It’s a really good episode, is what I’m saying. And then Carl comes in — the runt of the family, and the only non-kaiju character in today’s episode. That’s probably not a good sign for him; exposure to too many kaijus can be bad for your health. But Carl’s got big news — the biggest there is, on this show. He’s found out that the vampire is cousin Barnabas. It’s an exciting moment, because this is the thing that the show has done everything in its power to prevent since mid-April 1967. Thanks to Dirk’s brief reign of terror and Barnabas’ non-stop parade of incompetence, the family now accepts that vampires really exist, and from there, it was only a matter of time before somebody figured it all out. This is the moment when Lois Lane realizes that Superman is just Clark Kent with a makeover, which took forty years and even then it only happened on a parallel Earth. Carl Collins swoops in and gets the scoop instead. Carl says they’ll have to kill him, and he runs off to get a gun — leaving Quentin alone in the foyer for a thinks monologue. So that’s Quentin’s final initiation for Murder Club, the gang of supernatural monsters who cover up for each other’s crimes. Getting full membership in Murder Club is crucial if you want to be in the top tier of kaiju, and the key ingredient is that you need to know that Barnabas is a vampire. There have been other junior members before — Chris Jennings, and Professor Stokes — but they never learned Barnabas’ secret, so they never made it to full membership. Quentin’s spot is now secure. So Quentin and Carl make their way through the fogbank to the mausoleum, kicking over every table they can find. 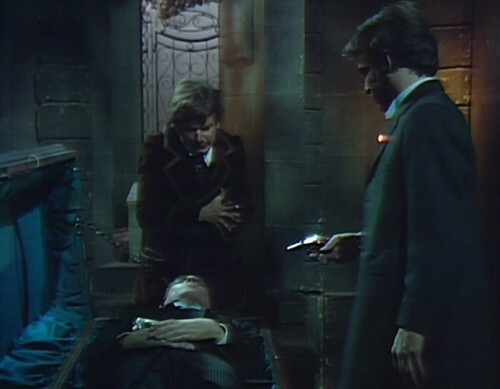 And they end up here, looking down at Barnabas in his coffin, with a gun in Quentin’s hand and another 466 half-hour episodes to fill. If they shoot Barnabas now, it’s going to be a long two hundred and thirty-three hours on the ride back, so they’re going to have to come up with something else to do. And they do, bless them, they absolutely do. 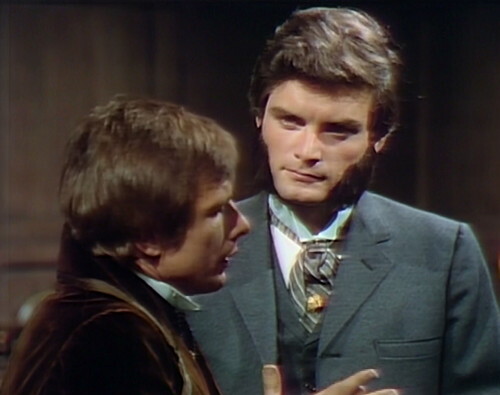 Quentin knows that he needs Barnabas — as a friend, as a mentor and as a fellow member of Murder Club. 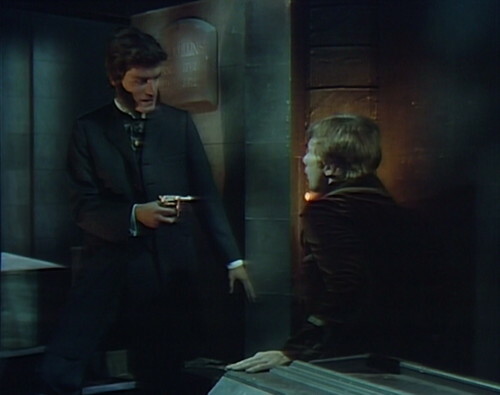 So he holds Carl at gunpoint, and locks him in the secret room, knowing what Barnabas will do when he wakes up at dusk. 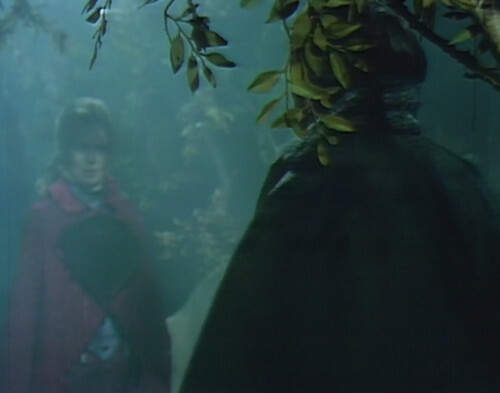 There’s still another act left to go in this episode, but Barnabas is asleep and Carl’s locked up, so the third act is just Quentin talking things over with Magda, and then Magda doing the same with Angelique. And then Carl happens upon the secret switch that lets him escape, and so do I, and here it is. Friday, here I come. In the cemetery, after Barnabas walks away, Angelique turns and brushes two wobbly gravestones with the edges of her coat. About thirty seconds later, Carl emerges from hiding, and brushes aside a wobbly tree. Quentin shouts at Magda, “Cruel to the end! Yes, cruel!” He turns away, and she wipes off a little bit of spittle that he’d just fired at her. When Carl enters the mausoleum with Quentin, the boom mic doesn’t catch his first line of dialogue. Magda tells Angelique that she knows Angelique loves Barnabas. 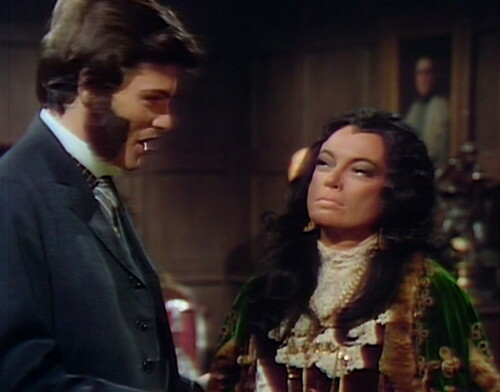 They both treat this as a revelation, but Angelique is already posing as Barnabas’ fiancee. I’m not sure Magda figuring out Angelique is in love with Barnabas is a blooper. 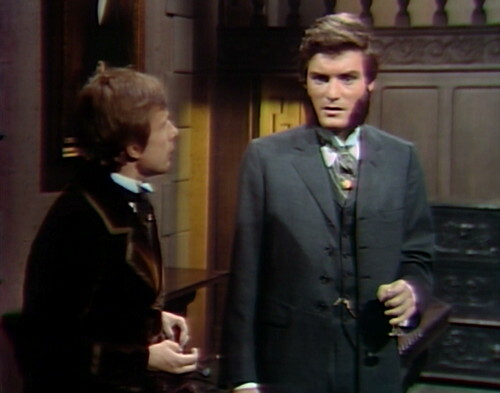 Everyone else believes Barnabas is a long-lost cousin from England, so his having a fiancee makes sense, and her following the traditional fiancee-rule of being in love with him makes sense. 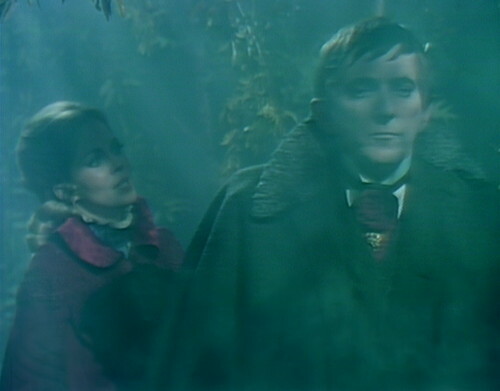 But Magda knows Barnabas is a vampire from the future, and a vampire from the future really doesn’t make sense. So if she’s not his fiancee, there’s no reason to assume she’s in love with him. I think about things too much. Well Angelique doesn’t know the meaning of love- so she doesn’t love Barnabas it’s a lustful, cruel controlling obsession she has.Of course Magda doesn’t know the back story so she is just assuming stuff. 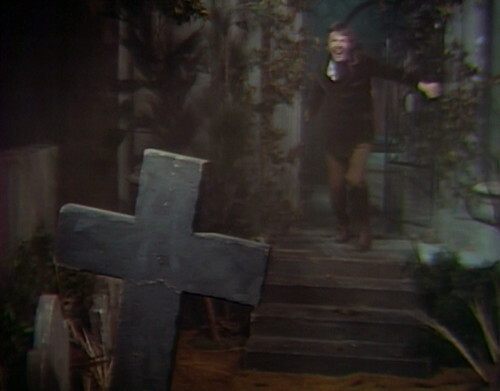 I always tear up when Barnabas is grieving by Rachel’s grave. Okay – I’m a sap for Barnabas and Josette. Oh and – “Dammit isn’t God’s last name? ?” I’ve got to hear that mess. I love John Karlen in this episode. He’s so great when he angrily slams his fists down on the coffin and then immediately gets scared and pulls his hands back. That is one of my favorite moments. Usually the boom mikes are as thick as flies. But, when you actually need one, there’s nary a one to be found! 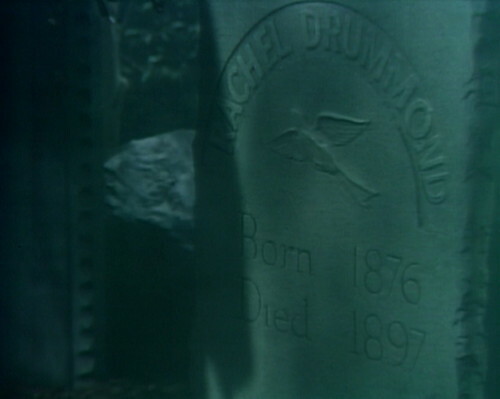 As for Rachel Drummond’s tombstone, I’m sure Barnabas is right there with the ready cash for any Josette clone’s monument if her family can’t afford it. Still one of my favorite Franki Valli records. The vinyl 45 RPM I bought at Woolworth’s 45 years ago sounds better than the dreary CD version. From white trash Willie Loomis to madcap eccentric heir Carl Collins–for versatility and theatrical flair, John Karlen really is among the top three actors on the show. But, alas, Carl’s days must surely be numbered, as you can’t discover Barnabas’ secret and not be part of the Murder Club and live to tell about it. Karlen must have another extensive theater part in the works. I wonder what “it” was that Bob Dylan thought he’d thrown (all) away. In her autobiography Faithfull, Marianne Faithfull writes that when Dylan paid her a visit in 1979 he kept going on and on about how sad he was that nothing had ever happened between them when they first met in the mid-1960s. Perhaps that was “it”. You know, I think that a DS reboot should have chartered “three hour tours” for characters whose actors have to leave. I would like to think of Rachel and Carl with Gilligan, the Skipper, a millionaire and his wife, a movie star, the Professor, and Mary Ann. Regardless of whether Carl had to die for plot purposes, his death had a profound impact for me the first time I got to know Quentin. I was certain, that even after everything he had done, he surely wasn’t going to let his brother die? Surely not? Just stand there and let his frail, possibly dimwitted brother just be killed in cold blood? And he does. And you learn something about Quentin that you wouldn’t learn if Carl had just moved to Atlantic City to end his days in a futile search for his beloved Pansy. That line about the new “King of the Gypsies” is interesting. I don’t know a huge amount of history, but of course I know about the tradition of the new ruler pardoning prisoners (largely to look good compared to the previous ruler). Was Quentin actually talking about that tradition possibly getting the curse removed, or did he just bring it up sarcastically? I don’t think I’ve ever heard “God’s Last Name Isn’t Dammit,” but I should. Whether it’s wrong or not, that phrase is easily my “favorite” expletive (I’ve never been fond of the “scatological” ones). Because of that, you’d think the song would feel like a guilt trip to me, but instead it would just be interesting.